I’m looking forward to the weekend – tomorrow we’re going to a small festival in the van at the Rollright Stone Circle (if the weather holds off) and Sunday we’re having a barbecue/camping do for P’s birthday. We’ve been busy planning ABCD (African Beats Camp Day) which is happening at the beginning of June the last few days and it’s going to be an amazing event but we need to sell more advance tickets to make it feasible. My sister from Oz is in the country and I can’t wait to see her next week – it’s been about 3 years since I’ve seen her – much too long. Back to normal – thank goodness. I’m really fed up at the moment – because there were no decent priced flights to return together from the Gambia we decided to travel back separately – me on the 9th and P on the 21st. Well I got back alright but then the unpronounceable Icelandic volcano did its thing and now he’s stuck out there. He’s been told he should get on a flight on Monday – that’ll be over 2 weeks apart – which I suppose is nothing really but it’s so quiet where we live that I confess to getting lonely here on my own. When I lived in Bristol there was always loads of people around and places to go – it’s not the same here though of course it’s very beautiful. Anyway – I think I’ll go and see my daughter and grand-daughter this weekend if she’s free and then I’ll enjoy the time rather than sit at home festering like an old volcano myself……………. Please go away so my man can come home on Weds…………..
I’m back in the UK after a great trip to the Gambia and the Casamance region of Senegal helping organise two music festivals. The first festival was in Kartong where for the first time we managed to get the local organising committee to do most of the pre-planning and organising themselves – this will eventually mean the festival will be able to go ahead without us – essential if it’s survive into the future. The second festival at Dombondir was amazing – it was inspired three years ago by the Kartong Festival and the local people work very cooperatively to make it happen and despite a few setbacks it went well in the end. 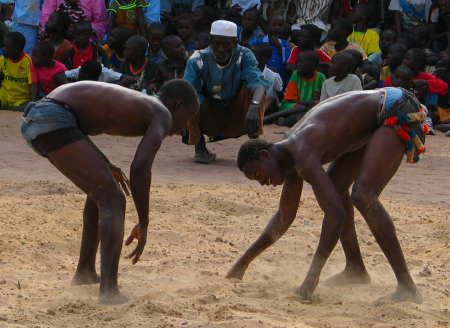 There was a great wrestling championship as well as local cultural music and dance troupes. There’s so much I could write about my experiences there but I just don’t know where to start really! I always feel so at home there and the friendships I’ve developed over the years there feel as deep as any in the UK – although we only get to meet for a few short weeks of the year. I spent many hours playing my flute with my friend Moriba and I’m going to compile a CD of Kora and Flute music over the next few months and put it up on www.myspace.com/moribakuyateh.